Someone close to me but who wishes to remain hidden shared recently that she would often face this question in her mind as to why the Qur'an, when read by a woman, feels like a Book addressed exclusively to men. This is not an unique scenario of Qur'an. In fact all the scriptures when read sensitively generally appears to address men, talk about issues of men, their problems and solutions etc., and very few verses or portion seems to address the women. Its even more glaring for earlier revelations such as the Torah and the New Testament. In the Qur'an at least we find for the first time in a major revelation which dedicate verses exclusively for women's right, their right to inherit property, right of the women in marriage, right of divorce, laws of divorce, command to give reverence to the womb that bore us etc.., in the Quran we have chapters by the title Women (Nisa), Maryam (Mother Mary) and Sheba (Queen Sheba during the time of King Solomon) something quite unusual for Old Testament or New. Same goes to Eastern Traditions of the past. Whether we look at the Biblical narratives or in the Qur'an, we find that almost all the Prophets and Messengers of God were men, the whole energy of the Bible or Qur'an seems to be male dominating. In short the Religious Text or Prime Scripture seems to carry a gender bias. While exploring this subject on her own and introspecting, herself being a practicing and contemplative faithful person, she eventually came to this realization that women's relationship with God is very exclusive, of hidden in nature and very private, and thus it is not openly shared and discussed. This is why in the Scripture though there are a number of illuminated women figures who are even mentioned by their name, yet their stories are much hidden than exposed in full new. And I think this is very important point we tend to overlook or forget when we try to rationalize everything. Certainly there is truth to the above mentioned realization. Let me explain why. Before going into the inner reasoning as to why women are often veiled from the common discourse in Scriptural narrative, first we may look from a more practical level, specially from the socioeconomic atmosphere of the times when revelations came. If we could transport ourselves back in time, say two or three thousands years ago to a human society (any society in that matter), as far as we know from historical knowledge, women had a very different role than what we see in post-industrial world. The economic activities of women were much different, so were their roles. Women had more natural and organic place in the inner circle of activities, in the upbringing of children, motherhood, role as care giver, companion and in some occasion as wise counselor, but all of these were done behind the curtain. On this point Mystic Llewellyn Vaughan-Lee's talk on "Feminine Consciousness & The Masculine Mind" is good to listen. (+) Click here to download the mp3. Its quite true that religious scripture, be it Hindu Veda, Jewish Torah or Christian Bible and the secondary sources - almost all of them have serious gender bias. Not only their discourses are male gender specific, but sometime they could be found seriously antagonistic towards women. In many traditions women were seen as source of evil, medieval Europe even discussed within the excuse of theologian debate questions as to whether female had any soul or even if they did, how inferior it might be compared to men. There are serious problem found by modern scholars about how women were seen in certain ancient Hindu texts. One aspect of this issue stems from the fact of considering women less by certain figureheads in those traditions (Peter for example was not a fan of Mary Magdalene and openly protested to Christ as found in Gnostic Gospels. Simon Peter is known to have openly said, 'women are not worthy of life.') The other aspect remains is the fact that narratives about the virtuous women are found to be so lacking when compared to male characters in religious texts. If we dig deep into the possible reasons, one thing is very clear to understand that women's relationship in human society were quite different than today. Participation of women in society was very limited in societies thousands of years back and it was mostly men who ran every kind of activities, from economic to political, from food hunting to administrating power. The period of major religious revelations were well within that influence and thus the language of the revelation which occurred within time, had the effect of its time. Also since history was written by almost exclusively by men, and even out of that population of common people only few were privileged to have access to reading and writing skills, it is understandable why we find very little description of the women who might have been around powerful personalities. It was not just the norm to bring into exposure those who were considered belonging to the inner streams of life. This perspective explains why we know very little about women disciples of Jesus, even about Mother Mary the Bible is astonishingly silent. For this very reason we know so little about the Mother of Moses or wife of Abraham, mother of Ishmael. All of these women, as far as we gather from their role in history, were spiritually and otherwise very very powerful. 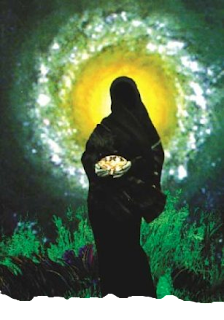 They were almost equivalent of powerful high priestess who had direct access to the Divine Presence or with Whom God communicated through revelations. Never the less, the nature of time was such that their incidents were not widely known (since they spent their entire life in semi-seclusion, by remaining as personalities of inner circle), and even lesser transmitted. Apart from socioeconomic or societal structural reasoning, there is another very important point we often overlook when we explore this question as to why Scriptures have less coverage on women, even in the case of specially chosen and spiritually gifted women. And the answer lies in the very nature of the feminine. The actual point is about the reality of feminine nature and her relationship with everything. Everything that comes into life has two sides, a masculine and feminine quality, even love. The masculine side of love is “I love you.” Longing is the feminine side of love: “I am waiting for you. I am longing for you.” Longing is the cup waiting to be filled. The soul is feminine before God, waiting in a state of surrender for the Beloved to come... The lover waits for her Beloved. And when He comes to us, in those moments of meeting and merging that are so intimate that one can hardly speak of them, the lover is feminine, pierced, penetrated by the tremendous bliss of His love. A number of qualities of the pure feminine aspect include: surrender, receptivity, privacy, veiling, seclusion, to disappear. This is exactly why even the most luminous female figures in the history, their deep relationship with God are not described or talked about. They are not featured as prominently as we think from our perspective, and this is because of the hiddenness of the feminine quality. To give specific example, we can take Khadija, the beloved wife of the Prophet who played very serious role both in the private life of the Prophet as well as to the struggle of his mission. It was Khadija who counseled and gave her strength even on the very night when Prophet received revelation and were completely baffled by the unexpected experience. It was Khadija who consoled him, spoke words of faith to him and helped him recognize the truth of his momentous experience by taking him to a very old and wise man Waraqah. This incident alone is quite symbolic. It required a woman to help recognize who he was, what his greatest role was. Yet about Khadija and her personal devotion to God, very little is known. Similarly Fatima, the daughter of the Prophet who was known to resemble the Prophet the most than any other family members, when she was about to leave the world, her last wish was that her funeral be done in secret and her final resting place be not known to anyone. Again we face the reality of hiddenness, the complete and voluntary disappearance, literally. This is a quintessential quality of the elect who chose to hide themselves completely, and this also an act of surrender, again a feminine quality. Interestingly enough, this not exclusive to females only. The most intimate relationship with God by God's most elect servants become veiled as they enter into higher planes of surrender. When we wish to turn out attention about the inner life of Mother Mary, her utterly devoted period in the Temple, her difficult times while she carried Jesus in her Womb - we are made disappointed because these are not divulged to public, not even through Scriptures. Similarly we know very little about Mother of Moses or the most intelligent and dear companion of Jesus Christ, Mary Magdalene. This is precisely because by the very nature of feminine quality, it becomes hidden. This hiddenness is a testimony to the truth that human language and the landscape of mind has its limit. 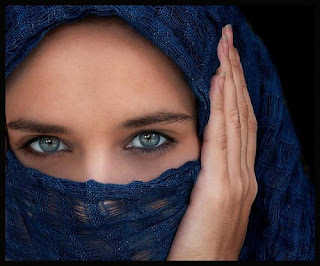 For the same reason, the special friends of God or awliya Allah are known to remain hidden under the cloak of God and this hiddenness is again stems from feminine quality of true surrender, complete receptivity to the Beloved, the disappearing in God. Similarly the narrative of the ascension of Prophet Muahmmad seems to stop at a point where human language cannot enter. This is again the feminine quality manifesting in disappearing in God. Inna lillahi, wa inna ilahi rajiun. Indeed we are for Allah, and to Him is the return. This belonging to the Beloved is also a quality of the feminine, and also to return to Him is disappearing into Him and through this greater reality of disappearing in God that we attain eternal life, we truly live in al-Hayy, the Ever Living Who dies not. To leading Sufi mystics such as Ibn Arabi, for him male and female are coupled together in a necessary cosmic unity on the level of both Creation and Gnosis. "And there is no more powerful creature in the universe than woman." And it is the resilience, the endurance of a woman from her bearing the childbirth to patiently up bringing children are all testimony to that. To Ibn Arabi, both men and women share all the ranks of sainthood, even that of the Pole (qutb). Prophet, peace be upon him, said, "Women and men are siblings (shaqaîiq)", it would have been sufficient; that is to say, all that is rightfully a man's, in terms of stations, degrees and qualities, is also possible for whichever woman God wills. The matter is summarised in the fact that God (haqq) can never be witnessed divested of matter. And since witnessing cannot take place except in matter, a man's witnessing of God in woman is the grandest and most complete witnessing. "God is never seen immaterially; and the vision of Him in woman is the most perfect of all." In this sense, female woman is one who completes male man in gnosis. How did Ibn 'Arabî present this idea? It springs from contemplating the prophetic saying: "I was made to love three things of your world, women, perfume, and the freshness of the eyes [that was brought to me] in prayer." It may be deduced that the basis is man's yearning for his Lord, who is his origin, and that is why God made him love woman - for as God, the Most High, loves him who is in His image, He makes loveable to man the woman whom He extracted for him from him and who appeared in his image. When man loves woman, he desires to conjoin and unite with her, and when the act is consummated pleasure overtakes all parts of the body, and it is as if he were annihilated in her. Thus, as God is jealous for his servant, He orders him to perform a full ablution in order that he be cleansed of "other", and return to observing Him in the one in whom he has been annihilated, i.e. in woman. God has cleansed man by complete ablution because he has to witness God in woman, and that is the grandest and the most complete contemplation, because it is a witnessing of God as actor and acted-upon simultaneously. Ibn 'Arabî shows a great deal of ingenuity when he makes femaleness a cosmic principle permeating through every creature and product, sharing with maleness the act of creation in every plane. Femaleness and maleness are equal in their ontological amplitude, but they are separate in their roles and degrees of being. Femaleness is a degree of receptivity, of acted-upon-ness, and of being effected by maleness, which is the possessor of the degree of actor and acted-upon. It is also for maleness the place for depositing, seeding, growing, bringing into being, creating and manifestation. Each receptive and acted-upon and being effected is in the degree of female even if it be male; and everything which is a place for depositing, seeding, growing and creating, is in the degree of female even if it be male. Therefore, every creature in the universe is "female" on both the ontological and the gnostic levels. - She is waiting to be recognized. - Do you mean she wants to be recognized as a woman? And they asked him in amazement: "Who is our Mother and which Her angels? And where is Her Kingdom?" Jesus replied: "Your Mother is in you, and you in Her." Though Fatima was his daughter, the Prophet Muhammad called her Umm Abi’ha (mother of her father). About Fatima, Prophet said, "The most beloved of my family to me is Fatimah. Whoever hurts Fatima, hurts me, and whoever hurts me, hurts Allah, exalted be His Majesty! 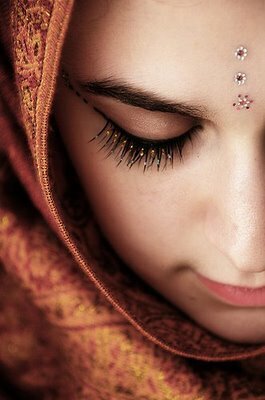 Fatimah is part of me, and whoever pleases her, pleases me." Woman is a beam of the divine Light.She is not the being whom sensual desire takes as its object. She is a Creator, it should be said. She is not a Creature.